National Databases and Registration Authority (NADRA) is the premier body of Pakistan for issuing nationality related credentials to citizens. Established in early 2000s, NADRA has earned praise for developing a huge database with a reasonable degree of security. Under-developed countries like Sri Lanka have also used the services of NADRA to develop their own nationality database. However, lately several officers of NADRA have been involved in issuing illegal Computerized National Identity Cards (CNICs) and that has resulted in serious problems especially in Balochistan. This week it was reported that 40 NADRA officials had been found to be involved in issuing CNICs to terrorists. High profile Al-Qaeda and Taliban terrorists, who were foreigners, possessed Pakistani CNICs. The report had further revealed that 22,000 fake CNICs were issued in 2014 and 64,000 in just seven months of 2015. Although fake CNICs have been issued all over Pakistan but Balochistan is the center stage of this practice where Afghan refugees are the beneficiaries. It was revealed in a meeting of District Council Chagai that incumbent Afghan President Asharf Ghani also holds a Pakistani CNIC. Member district council, Malik Dilmurad Hasni, presented documentary proof that a Pakistani CNIC was issued to President Ghani. This was shocking news and speaks volumes about the incompetence and corruption prevailing in NADRA Balochistan. President Ghani has never lived in Pakistan and therefore it’s simply unfathomable how he got a Pakistani CNIC issued in his name. NADRA in Balochistan was repeatedly blamed in the past for issuing CNICs to Afghan refugees. These blames were rejected as political rhetoric and mere allegations until NADRA employees confessed to this crime. In the beginning of this year an anti-corruption court in Quetta sentenced two data entry operators of NADRA, namely Manzoor Osto and Allah Baksh, to 21 years behind bars. They were found guilty of issuing thousands of CNICs to Afghan refugees. 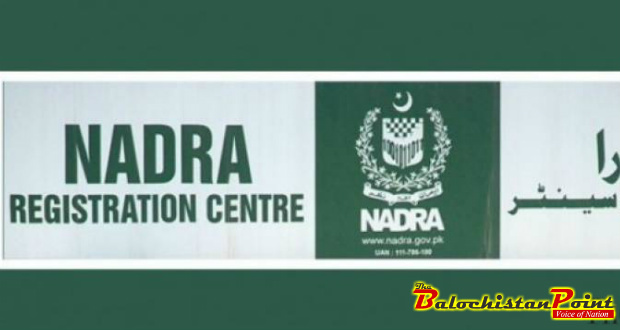 Last year, an accountability court in Quetta awarded seven year imprisonment sentences to two assistant directors of NADRA for the same crime; issuing fake CNICs to Afghan refugees after taking bribe. After conviction of half a dozen NADRA officials in Balochistan, Now it’s a fact that illegal CNICs have been issued to Afghan refugees in huge numbers. Druding investigation by Federal Investigation Agency (FIA) one fake CNIC racket admitted to have issued half million illegal CNICs to afghan refugees. Issuing fake identity documents anywhere is a crime and not good for the country. However it has greater importance in case of Balochistan. This province has a small population and different ethnic groups have their share in assemblies based on the population mix. Influx of millions of illegal Afghan Refugees with Pakistani CNICs would drastically alter the population mix of the province. The constituency allocation in the province would be affected and it will give rise to another conflict which would be catastrophic for the province. Balochistan has a Baloch majority population with a sizable population of Pashtun as well. Majority of Afghan refugees are Pashtun and that’s why it’s commonly believed that they would swell the population of Pashtun at detriment of Baloch community. It’s true that Baloch population is the primary victim of Afghan refugees with illegal CNICs but what is not known is that fact that Pashtun population will also suffer. The refugees will get the jobs and other opportunities form the share of Pashtun population. This means that NADRA, by issuing illegal CNICs to Afghan refugees, is badly affecting the interests of both Baloch and Pashtun in Balochistan. After conviction of its employees, NADRA has blocked CNICs of over 80,000 alleged Afghan refugees in Balochistan. This is not enough because NADRA officials themselves confessed to have issued millions of illegal CNICs, not thousands. According to official figures, Pakistan has 1.5 million registered Afghan refugees and another 1 million unregistered. Those refugees that have gained Pakistani CNICs are not a part of the aforementioned figures. So, blocking CNICs of few thousands of people is not the solution of this problem in context of Balochistan. Two things need to be done on urgent basis to tackle this problem before it becomes too huge to handle. Firstly, across the board governance reforms need to be introduced in NADRA. The internal controls of NADRA should be reviewed and all the necessary improvements should be made to close the door on illegal CNICs forever. All NADRA officials who have any connection with the practice of issuing fake CNICS should be held accountable and there should be zero tolerance for anyone. Second thing that needs to be done is the audit of all suspected CNICs issued in Balochistan in last ten years. NADRA has a sophisticated database and it will not be very difficult to identify the illegal CNICs issued to Afghan refugees. Having a genuine family tree in Pakistan should be the criterion for differentiating between genuine citizens and afghan refugees. At the same time, Baloch and Pashtun residents of Balochistan should not be harassed by NADRA in any way during issuing of CNICs to them. Afghan refugees had to leave their homes and flee to Pakistan in aftermath of Soviet invasion of Afghanistan. It’s a fact that they witnessed a lot of hardships in their initial years in Pakistan. Notwithstanding all sympathies that one should have with Afghan Refugees, they can’t be allowed to possess illegal CNICs and disrupt demographics in Balochistan.